“Basically, why would you want to give those nice folks in the blue box so much of your money in advance?” asks Ferguson. Nowadays, most worldwide travelers tend to use plastic: debit/bank cards for ATM cash withdrawals, and credit cards for purchases and cash advances. Don’t go forth without some preliminary research into your cards, though, as each bank has a host of fees, restrictions, and individual policies that could take a big chunk out of your budget. Once you’ve booked your trip abroad, do some research into the region’s money exchange services to determine the best method for your vacation. A one-size-fits-all approach to money is no longer valid, and each area may have a particular service that works best (as well as have specific roadblocks or impediments to changing money). Available services: A query for your destination plus “currency exchange” on search engines yields multiple results, from official guidebooks to traveler forums. Browse these results for what’s readily accessible in the part of the world you’re planning to visit. Make use of the traveler forums: Many are updated regularly and can get you real-time facts (rather than possibly outdated information from guidebooks). If ATMs are the preferred way to exchange money, which bank networks are most prevalent? What local fees are in place? Is U.S. currency widely accepted? Call your bank(s): If you’re planning on using your ATM and/or credit cards, call your bank(s) and let them know you’re going to be overseas; that way they won’t put a hold on your card, and you won’t have any difficulty with transactions. While you’re on the phone with them, inquire about the fees for using your cards abroad. Once you know what the charges are across all your cards, you can determine which will be the most advantageous (and affordable) for you to use while you’re on vacation. Not sure which card to take? Check out our Editors’ Choice Award for Best Travel Rewards Card for Overseas Use. Know what the fees are, regardless of change methods: Will you be using your credit card for cash advances or just for retail purchases? Know that the fees may differ by transaction type. Will you be converting travelers’ checks at a hotel, bank, merchant, or cash exchange bureau? Do some research to see which methods are the most economical. Once you’re on the ground, be sure to stay up to date with exchange rates. Each day, take note of what the latest exchange rate is using a service such as XE.com (also available on the go for your smartphone). When you know what the daily standard exchange rate is, you can avoid places that charge higher fees. Additionally, consider cash. “What’s really the most efficient is cash,” says Brosnahan. “[You can take] U.S. dollars, which you can then use if they’re accepted or get them changed there. I carry not a huge amount of cash, but more than people normally think of, and always keep it in a neck pouch or waist belt under my clothes. I’ve found it’s been pretty safe.” Ferguson also recommends cash, and tends to travel with between $200 and $500 in U.S. dollars. Regardless of what form of currency you use, if you do your research in advance and stay informed in-country, you should be well prepared for your trip. 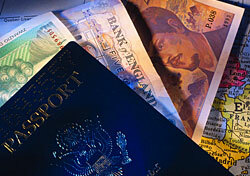 What’s your preferred form of currency when traveling abroad? What’s your opinion of travelers’ checks? Share your thoughts by leaving a comment below!